PARIS, MAY 31 (BNA) THE BAHRAIN ROYAL ENDURANCE TEAM FACED TOUGH CONDITIONS IN ITS FIRST PARTICIPATION IN THE COMPIEGNE SENIOR RIDE CHAMPIONSHIP (160 KM) TODAY AT THE COMPIEGNE ENDURANCE VILLAGE NEAR PARIS. THE CONTINGENT, LED BY ROYAL TEAM CAPTAIN AND BAHRAIN ROYAL EQUESTRIAN AND ENDURANCE FEDERATION (BREEF) PRESIDENT SHAIKH NASSER BIN HAMAD AL KHALIFA AND HIS DEPUTY SHAIKH KHALID BIN HAMAD AL KHALIFA, CONFIDENTLY SECURED THE THIRD POSITION DESPITE THE EVENT'S GRUELING 160-KILOMETRE RACE DISTANCE. THE BAHRAINI TEAM IS PREPARING FOR THE EUROPEAN CHAMPIONSHIP, ITALY, AND THE WORLD CHAMPIONSHIP, USA, IN 2010. SHAIKH KHALID WAS INJURED WHEN THE HORSE FELL ON HIM, THE FACT THAT NECESSITATED HIS WITHDRAWAL FROM THE THIRD STAGE OF THE RACE FOR MEDICAL TREATMENT. ON HIS PART, SHAIKH NASSER WITHDREW FROM THE FOURTH STAGE OF THE RACE AFTER HIS HORSE HAD BEEN INJURED. THE RIDE FEATURED FIVE STAGES, BEGINNING WITH A DEMANDING 35KM OPENING LEG AND ENDING WITH A CLOSING STAGE OF FIFTH 20KM. SHAIKH NASSER'S ROYAL TEAM PARTNERS WERE BREEF FIRST VICE-PRESIDENT AND AL KHALDIYA STABLES CAPTAIN SHAIKH KHALID BIN HAMAD AL KHALIFA, YOUSEF TAHER, GHAZI AL DOSSARI, AHMED ABDULLA, RAED MAHMOOD AL SAAD AND JAFFAR MIRZA. DESPITE THE WITHDRAWAL OF SHAIKH KHALID FROM THE THIRD STAGE OF THE RACE AND SHAIKH NASSER FROM THE FOURTH, AHMED ABDULLAH STRUGGLED TO SECURE THE 6TH PLACE. TOUGH RIDERS SPAIN, BELGIUM AND HOSTS FRANCE WERE COMPETING IN THE CHAMPIONSHIP. France swept the first five positions in the Compiegne 160-km Seniors Nations Cup with Larent Mosti and Khandela Des Vialette taking first place by less than two minutes over Guy Dumas and Mohac. Finishing time was 7:52:43. France also won the Gold in Equipes. Switzerland took the Silver, and the Bahrain team won Bronze. Riding Kaltsoum Cabirat, French Young Rider Roman Lafaure won the 130 km CEIO** Junior/Young Rider Nations Cup in a tight galloping finish over fellow French riders Justin Mourou on El Abiad Dejalima and Laetitia Goncalves on Jasmina Des Ayssade. France swept the first 6 positions, with Eulalia Gonzalez Guardia finishing 7th on Kacel. 32 of 51 riders finished the race. Today the CEIO*** - 160 km Senior Nations Cup will take place. May 30, 2009 (The Lexington Herald-Leader - McClatchy-Tribune Information Services via COMTEX) -- Jamie Link may be the chief executive officer of the 2010 Alltech FEI World Equestrian Games, but when it comes to riding horses, he's a novice. So when he and other top Games officials recently saddled up to see part of the 100-mile endurance course being mapped out across farms surrounding the Kentucky Horse Park, Link was given a horse with two names. One name was Rocket, which Link used frequently and emphatically as he maneuvered well alongside his more-experienced colleagues. Others called his golden mount by a name indicating a more gentle nature, Buttercup. This was a slow, four-mile ride over beautiful Mt. Brilliant Farm. But everyone was thinking about what it would be like for more than 80 competitors who will gallop over it in a day-long race against the clock on Sept. 26, 2010. Endurance racing will be one of the most high-profile of the Games' eight disciplines, for a couple of reasons. The race is scheduled for the second of the 16 days of competition and will be featured prominently, along with a recap of opening ceremonies, on NBC Sports' first hour-long telecast of the Games. That show has the potential to be a spectacular video postcard for Central Kentucky's horse country -- not to mention the glamour of the Games. But because the endurance race is so demanding, any televised deaths or serious injuries to horses have the potential to damage the reputation of equine sports in the eyes of a skeptical public. BAHRAIN's leading endurance horse riders have left for France to compete in this year's Compiegne Senior and Junior Rides starting on Saturday at Compiegne Endurance Village near Paris. The Bahraini team will be led by Bahrain Royal Equestrian and Endurance Federation president and captain of the Royal Endurance Team Shaikh Nasser bin Hamad Al Khalifa. The squad consist of prominent young riders, including Breef first vice-president Shaikh Khalid bin Hamad Al Khalifa who is also Al Khaldiya Stables leader. This year's event began yesterday with the opening of the stables. Tomorrow a restaurant and the secretary's office will be inaugurated. The first veterinary inspection for horses will also be held. The Bahraini members will attend the riders weighing and will also be briefed on the rules and regulations. On Saturday, the 130km junior ride will begin at 8.30am (Bahrain time) and is set to conclude by 5.30pm at the Equestrian Stadium while the awarding ceremony will take place at 6.30pm. The senior race, which is over 160km, will be held the following day with a 8am start. It's expected to conclude at 5.30pm and will be followed by the prize-giving ceremony at 9pm. THE trails snaking their way through the scenic Imbil Forestry will barely have settled down from the Rally Queensland event earlier this month when the Australian Endurance Championship is held in Imbil over the Queen's Birthday long weekend next month. The event, officially recognised internationally by the World Equestrian Body FEI, will see riders and their horses from regions across Australia gather in Imbil for a weekend of endurance horse riding. And while the speeds will be far more leisurely than the rally cars tearing up the dirt in the Rally Queensland event, spectators who turn out to witness the event can be certain to see some brilliant competition and rivalries. Three rides will take place over the course of the weekend, the feature event being a testing 160 kilometre ride - known as the Brookleigh Stud 160km FEI Australian Championship event. This major endurance race is being organised by the Far A Way Riders Club. The club is credited as being one of the most active organisers of endurance rides across Australia. Meanwhile, some of Australia's most decorated endurance riders will be competing in the Imbil event, all with the hope of qualifying for selection in the Australian team to compete next year in the World Endurance Championship in Kentucky, USA. Prominent Queensland competitors aiming for a shot at Australian selection include brothers Brook and Matthew Sample, Penny Toft and Derek Armitage. All riders represented Australia last year at the World Championships in Malaysia, adding depth to the starting line-up. Gympie regional horse enthusiasts are encouraged to attend the event as spectators to witness the event. Dubai: Meydan City have announced their sponsorship of the FEI European Open Endurance Championship to be held in the Italian city of Assisi on September 26. Addressing a press conference Mohammad Al Khayat, Meydan's communications director said, "The European Open championship is one of the most important endurance events this year. With over 100 riders from over 30 countries expecting to participate, this championship is truly a global event". UAE are one of the favourites for the championship which is held once every two years. The event will include competitions in the individual and team categories. Meydan City's Chairman Saeed Al Tayer said, "Endurance horse racing is part of the UAE's culture and heritage. This special collaboration will further enhance the UAE's participation in this sport and assist in increasing its exposure in the region and worldwide". Ali Mousa Al Khamiri, general manager of Dubai Equestrian Club, who also addressed the press conference said: "Endurance already has a huge profile in the UAE where some of the world's top riders hail from. We look forward to what will be a long-standing partnership with Assisi". Paolo Dionisi, the Italian Ambassador to the UAE said: "I have been here for over three years and have enjoyed the growing bilateral ties with the UAE. Apart from the great endurance championship, Assisi will also be staging a major economic conference and it is going to be a great success. "The city of Assisi is all set to welcome the equestrian fraternity of the world. The natural scenario of Assisi has been chosen to stage the endurance championship. The Umbrian countryside will be the setting for the 160 kilometres event," said Claudio Ricci, Mayor of Assisi. "Assisi is a World Unesco Heritage city and we are ready to stage a great championship with many other events on the sidelines," he added. Gianluca Laliscia, Chairman of Assisi Endurance Lifestyle and a top Italian endurance rider said: "This year for the first time we will be using the GPS [Global Positioning System] which will help us to see the exact location of each of the competing riders and horses. "Apart from that the terrain for the 160 kilometres event has a very diverse and challenging nature with very [few] tarmac roads." "The international event will include a prestigious Workshop on Real Estate Investments in Umbria promoted by Sviluppumbria, an International Veterinary Symposium, an important round table on hippotherapy, an art exhibition & and finally an entire week-end dedicated to & children," Laliscia added. SETIU: Yang di-Pertuan Agong Tuanku Mizan Zainal Abidin yesterday joined 109 other horse riders in the Edaran Endurance Classic 2009, which started at the Terengganu International Endurance Park (TIEP) here. Tuanku Mizan, astride "Jakim Murphy", is representing the Royal Terengganu Endurance Stable (RTES) and is competing in the 120km category with 15 other riders. The race is scheduled to end at 11am today. Meanwhile, the Regent of Terengganu, Tengku Muhammad Ismail Sultan Mizan Zainal Abidin, and elder sister Tengku Nadhirah Zahrah are taking part in the 40km category. Australian endurance rider Meg Wade, who was injured in a ride on April 12, has regained consciousness in hospital in Canberra. She is able to eat, she is responding to questions, and she understands what is being said to her. She continues to show daily progress and will be in rehab hospital soon. 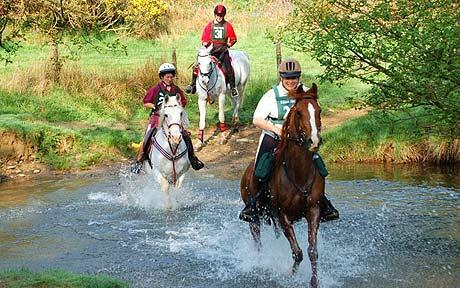 THE Wadebridge Ride started in the 1970s and is the first competitive endurance ride on the South West calendar. Stevie Martin was ride organiser and received back up from a team of volunteer helpers. Held at the Royal Cornwall Showground, the ride also benefited from generous core sponsorship from Sweet Meadow Horse Feeds. "This ride takes in quiet lanes and forestry tracks and is perfect for a straightforward start to the season," said Jane Holden, of Endurance GB South West. "Experienced members use it to bring on their young horses while novice riders make it their first competitive ride." One rider enjoying her first experience was eight-year-old Saffron Bishop from Altarnun who partnered her pony Scarlet alongside her father Tristan. At 18-years-old, this little Exmoor cross Arab pony taught Saffron's elder sister Rachael to ride and to compete successfully in endurance riding. In 2002, they were among only four competitors to finish the 100-mile Golden Horseshoe Ride on Exmoor and in the same year they secured the Junior National Championship. Three years later they clinched the coveted U21s National Championship. For the past two years, Scarlet has been on loan to the Chisholm family, from Lydford, and has taken sisters Tess and Abby up to advanced level endurance riding but this wonderful schoolmistress has now returned back to the Bishop family to start all over again with Saffron. More than 90 competitors and pleasure riders took part at Wadebridge, completing with a high number of Grade Ones. The Bodmin-based company Equus Health put up generous sponsorship enabling prizes to be awarded to the best turned-out horses and riders in the various categories. These were won by Carolyn Thomas on Midnight Mischief, Ann Jobson on Samson, and Katie Came-Johnson on Pompei. The Sweet Meadow Horse Feeds awards for the best in class came under scrutiny by the team of vets. These awards went to Lesley Dore on Firebird, Valerie Crocker on Prince Nadem and Vicky Mosey on Betty. The farrier's award went to Arthur Bell of Truro and Alex Prout's mare Tilly. AT the recent Golden Horseshoe Ride, Jill Thomas, champion endurance rider achieved a Gold Award on her Akhal Teke horse, Pompeii in the Exmoor Experience (two-day 80K) Class. Jill has competed at Golden Horseshoe for many years and last week’s success meant that she has clocked up 1025 Golden Horseshoe miles since her first competition in 1986. Pompeii is relatively new to Jill, who has recently moved from riding Arabian horses to Russian-bred Akhal Tekes. Jill now hopes that Pompeii is going to be her future international star. Jill broke British and European speed records at the 1993 European Endurance Championships at Southwell. Since then she has worked with equestrian companies to produce informative books and specific endurance products, helping to raise the profile of this fast growing equestrian sport. be held later this year in Hungary. complete the rides by 11 am the following day. in the Edaran Endurance Classic series. For the first time, the SERC Scottish Championships are combined with the only FEI ride north of the border to create a 3 day festival of endurance riding based at historic Scone Palace Park. The event builds on the long term success of the SERC Scone ride, a popular part of the calendar for a decade. The route is tried and tested, having hosted a 2 day 160km ER in 2008. It features a wide range of terrain, from estate tracks, river bank and field edges to forestry and open hill. Though on the face of it there are no major climbs, the route is deceptively challenging with very little flat ground apart from the Palace grounds at the very start and finish. Many parts of the course offer spectacular views north to the Highlands or south over the River Tay to Fife and the Lomond Hills. Perth Racecourse, within the grounds of Scone Palace, provides the venue for the Festival. Excellent facilities are available, including hard standing for vehicle parking and space on site for camping and corralling. This part of the world is steeped in history. Scone is the historic crowning place of Scottish Kings, and the home of the Stone of Destiny - some say the real Stone is hidden near here still. Scone was capital of the Pictish kingdom from around 500AD, and Kenneth MacAlpin, first King of Scots, was crowned here within sight of our start line in 847, as was every subsequent Scottish King until James I in 1406. The last King to be crowned here was Charles II in 1651. A key part of the ride route is the Coronation Road, one of the oldest documented bridleways in Britain. For over 800 years this path has been in recorded use by Kings and their retinues; it was the original road from Falkland Palace to Scone. Falkland was seat of the Earls of Fife and home of the MacDuff clan. Since 1095 the hereditary right to crown the King of Scots has belonged to the Earls of Fife, making a horseback procession along the Coronation Road a precursor to every Monarch’s crowning. The Road is thought to follow a much earlier path and to have been in use for at least 1500 years. A little further on the route passes under Dunsinane Hill, as a hill fort a strategic location since the Iron Age, but a major seat of power in the early history of Scotland, not least as the stronghold of MacBeth. The decisive battle in 654 AD between MacBeth and the forces of the Earl of Northumberland was fought within sight of Dunsinane, and Shakespeare subsequently immortalised the location in his Scottish Play. Birnam Wood at that time may well have extended south to encompass some of our route, and the Witches Stane, a standing stone of Megalithic origin at St Martins, is reputed to have been the setting for Shakespeare's Witches scene. Strong winds, sunshine and moderate temperatures gave almost perfect conditions for this year's Golden Horseshoe Ride over Exmoor - and it resulted in a record Gold tally of 20 over the four classes. But in spite of some superb riding and on-course judgement, biggest cheer of the final day went to the diminutive Kingsby Nutmeg, the first Exmoor pony to take part in one of the competitive classes in the ride. Owned and ridden by vet's receptionist Mary Hannah, from Brompton Regis, the pony finished the first day and 25 miles of the 50-mile Exmoor Experience class in Silver position and then completed the second day with a Bronze award, losing the one place on time only. The 65 riders competing in the four classes - the 100-mile Golden Horseshoe, the 75-mile Exmoor Stag, 50-mile Exmoor Experience and one-day, 50-mile Exmoor 80 - netted a total of 20 Gold awards, 20 Silver and 10 Bronze. Barbara Wigley, who heads the organising committee, said: "It really was one of the best rides yet. Exmoor is very tough and can be hard on both horses and riders, but each year we see an improvement and this time everyone was impressed with the way the horses responded to the demands made on them and their fitness and condition at the end." In the 100-mile class, David Yeoman and Haszar were particular impressive, pressing ahead of the field for most of the day, closely followed by Lorna Hogg on De Marco and Carol Jones with Ptolemaeus. Sheikh Mohammed has demanded to know why the International Equestrian Federation (FEI) — an organisation headed by his wife, Princess Haya — delayed notifying him of a positive dope test on his horse, Tahhan. On 6 April, Sheikh Mohammed suspended himself from competition and began an internal investigation after his own team discovered traces of two potentially performance-enhancing drugs in Tahhan. He competed the horse in CEI2* 120km endurance races in Bahrain and Dubai in January and February this year. But has emerged that Tahhan was also tested by the FEI during the rides. The horse's positive results were passed to the FEI legal team on 19 March — nearly three weeks before Sheikh Mohammed's well-publicised statement that it was he who had volunteered the results. A spokesman for the Sheikh said: "HH Sheikh Mohammed notified the FEI on 3 April 2009. "The FEI notification to the United Arab Emirates (UAE) federation was on 6 April, 2009. HH Sheikh Mohammed received no communication from the FEI or from any other party, prior to 6 April. CuChullaine and Basha O’Reilly are setting off on the first continuous, around-the-world equestrian expedition. The journey will cover 12,000 miles, cross eleven countries, last two years and be the most highly developed diplomatic and scientific equestrian mission ever undertaken. The World Ride represents the merging of the Bronze Age activity of equestrian travel with cutting-edge twenty-first century technology. This will result in a “Genghis Khan meets the Matrix” combination wherein state-of-the-art electronics will allow reader/riders to participate from afar, thereby creating humanity’s first inter-active equestrian epic. This is a journey with a difference. Even if they succeed in riding around the world, that will not be the primary goal. En route Basha will be working with scientists and horse owners to collect hair samples from every known horse breed, thus creating the first complete equine DNA chain. CuChullaine will be using GPS technology to create a unique Long Rider map of the entire route, a project designed to highlight geography to school children around the world and encourage others to undertake their own World Ride. Ultimately, the World Ride is designed to link humans and horses via the saddle and the internet, with the goal being to demonstrate that all humans share a common mother-tongue, “horse.” This is a journey about courage, not records, and you are invited to explore this website, to follow the World Riders and participate in this unprecedented equestrian event. Abu Dhabi: One of the world's top endurance riders and a well-known faces in the UAE's domestic circuit, Margaret (Meg) Wade is still in coma since a fall during a ride in Tumbarumba, Australia on April 12. Wade, a champion rider and a breeder and trainer of endurance horses, was riding Castlebar Dell when the horse shied away from a puddle unseating her. "I was not there at the scene but since it happened close to a checkpoint she was attended by a doctor and ambulance staff," said her husband Chris Gates, speaking to Gulf News yesterday. "Wade was airlifted by Snowy Hydro Southcare Rescue Helicopter to Royal Canberra Hospital where she has been in coma since then," said Gates. "Her medical condition has improved and clinically it is not life threatening. But the doctors are waiting for her to come out of the coma. There seems to be a slight, very slight response," said Gates. Wade, who had finished second in a 90-kilometre Ladies Ride in Al Wathba after a 19th place finish in the 160-kilometre HH The President's Cup during the recently-concluded UAE endurance season, has had many horses bred and trained at her Castlebar facility in Australia. Wade has won three bronze medals at the World Endurance Championships, finished 4th individually in 2002 when Shaikh Ahmad Bin Mohammad Bin Rashid Al Maktoum won the gold medal, has been Australian Rider of the Year nine times and won the world-famous Tom Quilty Gold Cup four times. "We are devastated. Meg was a champion athlete and has never been in hospital. Very fit and athletic. I am confident that she will fight her way out of this," said Gates. Meg has been a regular participant in rides in the UAE since the 1998 World Championship and her husband said, "We received many calls from the endurance fraternity in the UAE and the world. The Royal families of Dubai and Bahrain have been enquiring about her progress," he said. Soon after the accident Gates had in an interview to ABC Radio said, "This is an injury that every horse rider fears. It happens, it's unfortunate. The riders all wear helmets but it's the fear behind everyone to have an accident that's so devastating,"
Gates said the fall was a freak accident, and other than her head injury, "Meg never sustained another injury. There's not a mark on her body." THEIR names are Luca, Marran and Paraku. Born in the Kimberley and captured in Western Australia last year, the three brumbies are starting a new life in the stables of the deputy ruler of Dubai, Sheik Hamdan bin Rashid Al Maktoum. They and 11 other brumbies including a young colt have left life as wild bush horses far behind. In the sheik's stables they are training for the demanding sport of endurance racing. Their arrival in Dubai completes a circle of sorts. Born wild, their pedigree traces back to the Arab horses taken to Europe over many centuries, the stock from which the modern thoroughbred was made. The horse, once the most important animal in Australia, still stands at the heart of Bedouin culture - and when Ali Mohammed Al Mohairi, Sheik Hamdan's racing manager, heard tales of the brumbies in Australia, he wanted to know more. Two years ago he went bush in the Northern Territory to see brumbies up close. But wild horses stop for no man. "There was a mare and foal and they were galloping from behind and I yelled to go, I was screaming at the driver," he recalled. "It was something amazing. Then they crossed in front of us and the sparks were coming off the road. When they came to a lake, they jumped straight in and swam across. "There was a rocky hill on the other side and I said: 'Impossible, they will not climb that'. And they did. "My imagination cannot go as far as this. I was amazed. And [then] they were gone and we never saw them again." But the story, worthy of an Arab Paterson in Mr Al Mohairi's retelling, took root. Sheik Hamdan, a leading racehorse owner and winner of two Melbourne Cups, was intrigued by the animals' capability in the wild but also concerned the brumbies - there are an estimated 400,000 in Australia - were being culled. "I felt I wanted to do something to help this animal. I told him people shoot them, five or six hundred at a time, and I said we [can] get some to try," Mr Al Mohairi said. The next step was to send a team into Lake Gregory, on the edge of the Great Sandy Desert, and to catch a dozen or so brumbies which were then trucked to Glen Innes, NSW, where they were broken in before being flown to Dubai. One mare, Marran, dropped a skewbald colt after capture. Marjii might have grown up in Arabia but he can't hide his past. "He's happy, friendly and playing but you can tell he's a brumby, with his face, big and ugly," Mr Mohairi said. The horses arrived last year and since then several have been prepared for endurance racing, which is conducted under the enthusiastic patronage of Dubai's royal family, notably Sheik Hamdan's brother, Sheik Mohammed bin Rashid al Maktoum, the country's ruler, who also competes in the events. On the track the brumbies' results have not been a complete success. The horses have speed, and can rapidly recover after running one stage of the race, but they don't want to run again. "They're not tired but they take care of themselves," said Mr Al Mohairi, who believes their wild instincts lead them to to preserve their energy for whenever it might be needed in the future. But the experiment at Seeh Al Salam stables will be given at least another year. "People here are waiting to see what this stable will do. If we do well with them, they will go there and do the same as we did," Mr Al Mohairi said. "To be honest, we spent money on them and I hope it will work. It will help me to look good in front of my boss because I asked him to do it, plus it will help the horses." Australia's premier endurance ride gains pace. The countdown is on, planning is in full swing and the excitement is starting to build as the 2009 Tom Quilty Endurance Ride draws closer. With only five months to go until Australia's premier endurance horse ride, organisers are working feverishly preparing for this major event scheduled for 18 September at Tonimbuk, Victoria. The Tom Quilty Endurance ride is an internationally acclaimed endurance event attracting riders and horses from around the world. The event tests the skill and fitness of horse and rider as they compete to finish 160km within 24 hours. "This year's Tom Quilty course is sensational," says Event Director, Lissy Verity. "Based at the world-class Tonimbuk Equestrian Centre, the course includes the beautiful surrounds of the Bunyip State Park, whilst also traversing private land, bush tracks and all weather roads. It is a highlight on the international endurance calendar without a doubt," she says. Despite part of the track being affected by the February bushfires, organisers guarantee the course will be ready for the September ride. Visitors and spectators won't be disappointed either as this picturesque area is also home to many wonderful wineries, restaurants and interesting tourist destinations. An experienced endurance ride organizer, Lissy knows better than anyone what is involved in running an event like this. "It's expensive, requires many volunteers and consumes enormous man hours to prepare for and to host," she says. "We are totally reliant on fundraising and sponsorship and given the current economic climate we are having to work even harder to raise the necessary funds to ensure a successful ride." Organisers are busy preparing for a major fundraising dinner in July to be held at the Cardinia Cultural Centre, Pakenham in the hope they can raise $25,000. One organisation that has already shown its support is Cardinia Shire Council. Council has committed significant funds and in-kind support, without which organisers would have faced an even harder financial challenge. Cardinia Shire Council Mayor Cr Bill Pearson says he is looking forward to the event, adding the Tom Quilty Gold Cup will put Tonimbuk - and Cardinia Shire - on a global stage. "It will be a fantastic spectacle and we expect thousands of people to be here for what will be one of the biggest events ever staged in Cardinia Shire," Cr Pearson says. "Council is proud to be supporting the Tom Quilty Gold Cup and we hope the local community and businesses really get behind what will be a fabulous showcase of equestrian skill and stamina." Mudgee endurance riders dominated the ride held at Tooraweenah on April 19, a result that shows that the locals and their horses are in great shape for the coming Cooyal ride. The Tooraweenah ride attracted 31 riders in the 80 kilometre ride and 34 in the 40 kilometre training ride. Mudgee riders Mette Sutton, Garry Bennett and Gloria Mills rode together throughout the event accompanied by Bernie Harvey from Tooraweenah. Bennett said it was a benefit to have Harvey ride with them as, being a local, it made it easier to find the track markers in the pitch darkness of the 5am start. This made sure the Mudgee contingent didn’t stray off course in the early stages but they were faced with a rocky, hilly track that was affected by the dry spell of weather, which resulted in horses having to travel over loose stones underfoot. Riders needed to be sensible in their approach to the course to ensure their mounts did not slip - especially when travelling down hill. Middleweight rider Bennett riding 'Karabil Yaningi' pulled away from his companions after the final descent down Ned's Mountain and crossed the line ahead of the field to win the ride in four hours 58 minutes. Sutton and 'Tuldar the Magician' were second across the line one minute after the winner and, much to Sutton’s delight, her mount was awarded the fittest horse. Mills and 'Glendos Sabodie' arrived back at the base for the final time shortly after her Mudgee co-riders to take out the lightweight division and the fittest horse for that division. Mudgee's only casualty on the day was Paddy Smith, whose horse was unfortunately vetted out lame. Harvey, who rode the early stages with the Mudgee contingent, was the heavyweight winner. Natasha Mitchell riding 'Rami' was successful in completing the training ride. The Cooyal ride, hosted by the Mudgee Endurance Club is just over a week away and ride organisers will mark the course this coming Tuesday (May 12). Local residents of Cooyal, Kains Flat and Botobolar are advised that endurance riders will be present on local roads on Saturday, May 16 and the following day. Endurance spokesperson Pat Dickinson said the Mudgee committee hopes that anyone interested in taking up sport will participate in the 20 kilometre social ride at Cooyal. "Endurance is not a race - it is a ride where the riders have to complete a course and do it in a way that the horse comes through the event fit and well," Dickinson said. “In the social ride there are no winners or placings awarded - it is purely an introduction to the sport and is designed to give riders an idea of the way an endurance ride is conducted. "An experienced pace rider will be appointed to accompany those taking part in the social ride. "The social ride generally has an average speed of 10kph or slower - it is an easy course and is more like a trial ride." Riders in the social ride receive a successful completion award to those riders whose horses who pass the veterinary examination after the ride. "We hope these awards encourage participants to aspire to explore endurance at a higher level," Dickinson said. "Our committee extends an invitation to all those riders who have been intrigued by the sport to come to Cooyal on the Saturday to find out more about this sport and perhaps take part in the social ride on Sunday." For further information or to register for the Cooyal ride contact Mette Sutton (63724960) or Par Dickinson (63735346). Forget hunting, endurance riding is all the rage among the horsey set. Exmoor's Golden Horseshoe endurance ride, which kicks off tomorow, is considered to be one of the toughest tests of horse and rider in Europe. It's just you and your horse over 100 miles of some of the most challenging terrain in Great Britain. All against the clock and your fellow competitors. Endurance riding (timed riding over long distances) is one of the fastest growing sports in Britain and, if you want to find out what all the fuss is about, you simply must trot down to Exmoor this weekend. It's pure horse heaven as the village of Exford turns into a clip-clopping sea of bay, chestnut and grey. You don't even need to ride to enjoy the spectacle. The atmosphere is distinctly carnival: crowds spill out of the pubs, while up at the event venue (above the village) there is masses to see and do: you can watch the competition horses being vetted, buy horsey paraphernalia at the stalls and catch dog agility displays and parades of proud Arabians and their doughty distant cousins, the native Exmoor pony. There are several different endurance races taking place over the next three days. The Golden Horseshoe ride itself is the big one with horse and rider competing over 100 miles on Monday and Tuesday. "Horses have to be very fit so only the very best endurance horses in the country can compete," says Barbara Wigley who heads the organising committee. "Most enthusiasts see a Gold award from Exmoor as having reached the pinnacle of the sport." What country it is too: picture-postcard villages, wooded coombes, babbling streams, heather-clad moorland. Ten to one you'll see herds of native ponies and the wild red deer, buzzards wheeling lazily overhead and the larks flying up from under your hooves. Mudgee rider Mette Sutton has been invited to ride in the South Africa national championships in July. Sutton was a member of the Australian support team at the world championships held in Malaysia last November. She said yesterday that it was during the world championships that she first became aware of the possibility of Australian riders being invited to ride in South Africa. "The president of the Australian Endurance Riders Association met with his South African counterpart in Malaysia about the possibility of some of our riders riding at the South African championships," Sutton said. "They then called for Australian members to nominate. "To nominate you had to be a member of the Australian Endurance squad, which is a squad for endurance riders who aspire to ride at representative level for their country. "I received my invitation yesterday (Wednesday) and had just 24 hours to accept. "I can tell you it didn't take me long to make the decision - this is too good an opportunity to miss." Sutton is one of six Australians that have been invited to ride at the coming South African championships. The South African championships are to be held at Fauresmith on July 7, 8 and 9. "We arrive in South Africa on June 26 to give us time to meet and familiarise ourselves with our horses, which are being supplied by the host nation," she said. "Their championships, like our Shazada, are three rides of 80 kilometres a day. "While they are run like the Shazada, they are considered to be the equivalent of Australia's national ride - the Tom Quilty." Sutton began her love of Endurance at age 15 and had a break to rear her young family and resumed in the sport in the year 2000. She is now one of Australia's leading Endurance riders and was named the Mid-Western Regional Council’s sportsperson of the year during the Australia Day celebrations in January. She won the popular Cooyal ride last year and on Sunday week will be out to defend that title. She then will ride in the Gulgong ride on June 14 - her last ride before she leaves for Johannesburg. A CEN 80 km, 60 km, 40 km, 30 km, and 20 km were also held. Complete results, story, and photos by Leonard Liesens and Caroll Gatelier at 2009 Mont Le Soie on Endurance.net. JILL Semmens from Penzance, who is a member of the senior development squad of Endurance GB, has been selected to ride at the Mont le Soie ride in Belgium this month. She is among five riders picked to take part in the 82 mile FEI 2* event and will partner her nine-year-old 15.1hh Anglo Arab gelding Evermore Exciting. Jill acquired her gelding as a three-year-old and has gradually qualified him up from the basic 20-mile endurance ride to compete at the longer rides under FEI rules. "Hopefully, we will try to achieve a 100-mile ride this year but my horse is still quite young for that sort of distance," said Jill. "He was not born until the end of August and missed the spring grass as a foal so I always think of him as a year younger than his official age." To be selected for Belgium, Jill and Evermore Exciting made the trip up to the King's Forest Endurance ride in Norfolk at the end of March where they successfully completed a 50-mile ER. SALMAN Isa Al Radhi of Hawar Stables clinched victory in the 120-kilometre Endurance Horseride Championship, the end of season endurance event, which concluded at the Bahrain International Endurance Village in Sakhir yesterday morning. Riding Aqaba St Nicholas, Al Radhi completed the five-stage night race on top in a time of five hours, 24 minutes and 25 seconds and an average speed of 21.19 kms per hour. Al Radhi put up a remarkable show in the last stage where he finished almost six minutes ahead of his main opponent Abdulla Al Khatri (5:30:22) of Al Asayel Stable who came second on Faras Kaoma. Rounding up the podium was Rachael Almeras, the first girl contestant to complete the championship. Riding Aargyle, the Royal Endurance Team rider clocked a total ride time of 6:03:26 and an average speed of 19.81 kms per hour. The event, which was held under the patronage of Bahrain Royal Equestrian and Endurance Federation (Breef) president Shaikh Nasser bin Hamad Al Khalifa, started with 82 riders from Saudi Arabia, the UAE, Oman, Kuwait and Bahrain taking part. However, 45 riders were unable to complete the race as 17 were eliminated after the first stage, 15 in the second, 11 in the third and two in the fourth stage. Al Khatry took the lead in the 30-km first stage in one hour, 19 minutes and 33 seconds. Behind him was Jaffer Merza (1:20:51) of the Royal Endurance Team in second place and Homoud Salman Al Shammari (1:22:27) third. Al Khatri maintained his momentum in the second stage, which was also over 30 kms, where he stayed ahead with a total ride time of 2:44:25. Merza kept his pressure on Al Khatri by taking second position in 2:46:11 while Al Radhi moved up to third with a 2:48:43 total ride time. In the third stage, which was over 25 kms, Al Radhi improved on his standings by taking second place with a total ride time of 3:40:44, just about 30 seconds behind leader Al Khatri while Shaikh Mohammed bin Khalid Al Khalifa of the Royal Endurance Team jumped to third in 3:45:57. Al Radhi took over the lead from Al Khatri in the penultimate stage which was over 20 kms. Al Radhi's time was 4:33:29, just 10 seconds ahead of Al Khatri who slipped to second. Isa Hazza from Al Asayel Stable made a good leap by moving up to third in 4:33:39. There was no stopping Al Radhi who held on to his lead in the fifth and final stage which was over 15kms to record his first win in the season. The awarding ceremony was held right after the race and was attended by Shaikh Nasser and other Breef officials who honoured the winners. Presenting the trophies were Breef general secretary Ghalib Al Alawi, media director Tawfeeq Salehi and Breef member Fahad Al Rumaihi. Shaikh Nasser said he was thrilled with the level of competition at the race and congratulated the winners and wished other riders success next season. One of Australia's top endurance horse riders is fighting for her life in the Canberra Hospital. Meg Wade remains in a coma after falling from a horse at Easter during a competition at Tumbarumba in New South Wales. It is not known what caused the accident during the event. Her husband Chris Gates says the doctors are hopeful she will recover from the serious head injury. "'We had a brief meeting with her neurological surgeon at the end of last week, and much to our surprise he was happy with her progress," he said. "You know she still is unconscious but her conscious level is rising. Mr Gates says the phone calls and letters of support from the international horse riding community have been wonderful. "Everyone's in shock. This is an injury that every horse rider fears. That's why we all wear helmets." 2009 Torres Del Paine: Steph Arrives! Steph is there and ready!